Reconfirm your Rockhampton transfer - we drive 125km each way! risk entirely. Myella will not take responsibility for any loss of property during their stay. If you have a medical condition please notify each staff member before commencement of an activity. Persons with health conditions must acknowledge that certain activities may pose a risk. Participation is not compulsory. Danger - Safety Never Hurt Anyone! Be aware motorbikes, horses and farms are dangerous. You could break a bone or worse! You can get really sunburnt; see the Irish girl to the right. 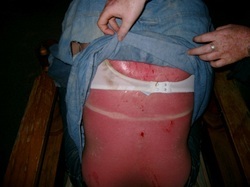 While sailing on the Whitsunday Islands she went to sleep in the sun in her bikini the next day travelled to Myella and fell off her horse when we looked to see if she was injured we found this sunburn and took her to hospital.